What could possibly connect Hollywood movie star George Sanders with the Malayan Emergency and the communist government of Hungary? On 24 July, 1952 Special Branch officers raided a house in the Lahat Road in Ipoh and arrested two women. They were held in custody and ‘rigorously interrogated’. 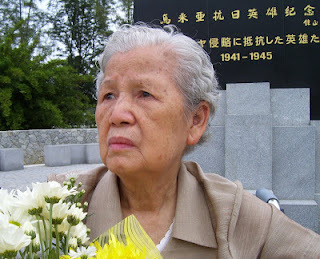 One of the women Cheow Yin ‘committed suicide’ in her cell. The other twenty four year old Lee Ten Tai, known as Lee Meng (photographed here in 2007) was eventually charged with possession of a pistol and a grenade and consorting with persons armed with weapons and ammunition. Under Emergency regulations, these charges all carried the death penalty. The assessor system in Perak, where Lee Meng was arrested, provided for her trial by a European judge assisted by two assessors. There was, of course, no jury. The judge had to agree with only one other person to convict and sentence a prisoner to death. Lee Meng faced her accusers in style. She was, according to the leering journalists in court, exceedingly pretty and her navy blue slacks and checked blouse showed off her prison diminished frame. The Straits Times headline declared: Pretty Girl Gave Murder Orders! (The same edition lamented the fall in the price of rubber.) She had the allure of a Malayan Mata Hari. Lee Meng was an articulate young woman and was ably defended by her Indian barrister Mr S.P. Seenevasagam who successfully demolished prosecution evidence as the self serving lies of former communists. At the end of the trial the two court assessors, who were both Asian, found Lee Meng Not Guilty – but Justice Thomson refused to accept their verdict and ordered a retrial: ‘Both assessor are of the opinion that you are not guilty. How, as reasonable men, they can come to that opinion I have no means of knowing. I disagree with their opinion and order a retrial.’ Ten days later, the new trial began under a new judge and new assessors. This time, one of the assessors was a European – and the court duly found Lee Meng guilty. At this second trial, the courtroom had been packed with lawyers and journalists: British colonial justice was in the dock. In the meantime, Lee Meng had been taken to Taiping Prison where she was locked up in the condemned cell on death row to await execution. Mr. Ernest Davies asked the Prime Minister if he can now announce the decision that has been reached on the offer made by the Hungarian Government in regard to the release of Mr. Sanders in exchange for Mlle. [sic] Lee Meng. The Prime Minister (Mr. Winston Churchill): Her Majesty's Government, after earnest consideration, have decided that they cannot entertain the proposals made by the Hungarian Government. Mr. Davies: Would the Prime Minister give the House any indication of the reasons which led the Government to reach this decision? In view of the rejection of this offer, will he explore every other possibility of obtaining the release of Mr. Sanders by making an offer on our side, or by entering into negotiations, in view of the fact that Mr. Sanders has been in prison for more than three years, convicted of crimes of which he is known to have been innocent? The Prime Minister: The answer to the second part of the hon. Gentleman's supplementary question is in the affirmative. We shall continue to persevere, but I do not think I ought to take up the time of the House in dealing at length with arguments as to the balance of reasons which have led us to take our decision. Churchill refused to be drawn. A week later, however, Lee Meng was taken from her cell and marched into the office of the Taiping prison superintendent, Mr. W.J. Burton. He had good news. The Sultan had commuted her death sentence to one of life imprisonment. She apparently showed no emotion. At the end of the year, the Hungarian government released Mr. Sanders: ‘Red Hungary Frees Briton!’. He had served three and a half years in prison. The cameras of British Movietone News were on hand to record Mr. Sanders’ arrival at Croydon Airport where he was greeted by his wife and daughters and gave a short press conference enthusiastically sucking on a cigarette. A tall, distinguished looking man, who bore a striking resemblance to his cousin the Hollywood actor George Sanders, Ernest found it hard to get a job in austerity Britain. He became a bus driver in Clacton. Although the British government had insisted he was innocent of all charges, Mr. Sanders admitted that he had passed on information to the British military attaché in Budapest; he had not, however, been paid a penny. The Malaysian government released Lee Meng nearly a decade later in 1964. She was banished to China. In Chin Peng’s judgement, she had never been sufficiently cautious and paid the price.